Sizing between the Dolores tops in our collection may differ in material and sizing. 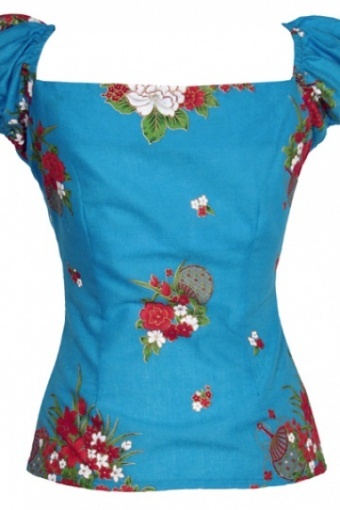 Please consult above sizing table to determine sizing of this Chinese top. If you are in between sizes, please choose the biggest one, material does not stretch! 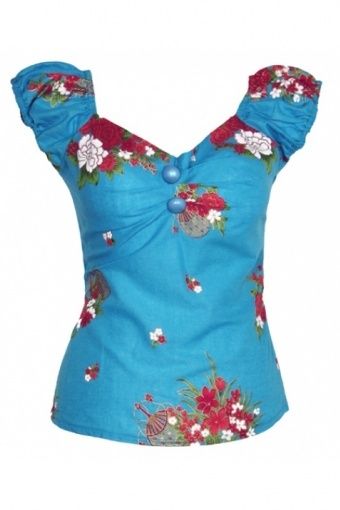 Model Kim wears size M.
Dolores Carmen top Chinese Flowers blue from Collectif. Olá Signora! 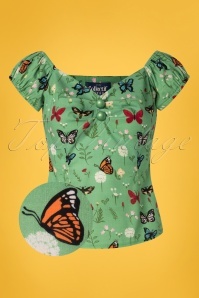 Gypsy style top with gathers around the neck and cute puff sleeves. Can be worn off shoulder. It is fitted through the waist. Finished of with a couple of fake buttons at the bust. Made of a light coton Poplin in a beautiful Chinese Flower print with red and white peony's and gold accents. 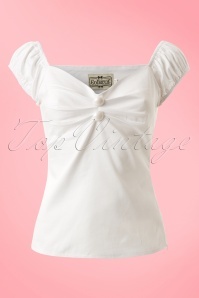 Side zipper, this basic is a must have! Pictures by Sjurlie, model Kim.